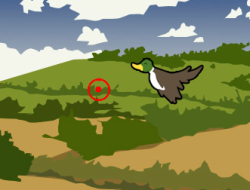 This is a fun shooting game in which the birds are destroying this drunk rednecks crops. He doesnt like them one bit, but seeing as he had a bit too much beer today he cant fire his weapons straight. Do your best to shoot them out of the sky and leave no survivors. The birds will be flying in waves and you will get paid for each one you shoot down. Upgrade your gear in the menu to become more efficient against these pesky feathered hunks of meat. Bird Blast 0.00 between 0 and 10 based on 0 votes.